Oodabug Alley: Verve October Mini Release Spotlight Hop!! 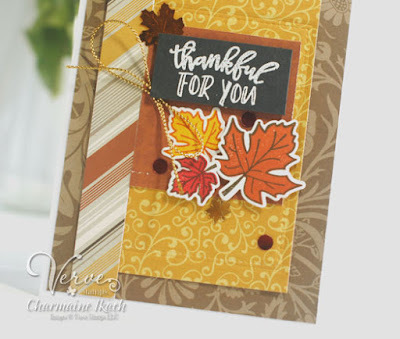 I love all the fall colors and patterns you've combined to create a fabulous fall card. Well done! Everything works so well together. Very pretty. I LOVE the color and design, especially in those leaves! This is a great new release! You have created a gorgeous fall card. Love the beautiful leaves. I love Fall colors; this is beautiful! NICE pattern mix. Love that the leaves have a solid stamp and an outline stamp. Great design, beautiful card with this new set. Beautiful color and pattern combinations! Fall is my favorite. Love your card. Love the pretty fall colors and those leaf dies. Your mix of patterned papers couldn't be more perfect. 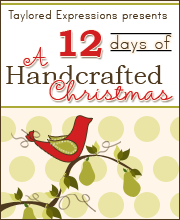 Beautiful card and love the papers you’ve chose ! My fav time of the year! So very pretty! Love the stripes and those gorgeous autumn leaves. What a pretty card. I admire your ability to mix patterns so nicely. Beautiful card and love the new stamps. Adorable card!!! Beautiful design and choice of colors!!! Such pretty leaves and I love your design! Love the patterns. I always look forward to your cards as they make me think about combining things I wouldn't normally do. Your card just screams FALL, it's absolutely lovely. Gorgeous paper choices! Love this, Charmaine! How pretty is this? What a lovely card! Beautiful design. I like the mix of papers and the leaves. This is pretty with beautiful fall colors! Very pretty fall card! This is such a great new fall stamp set. What a warm and pretty card to send someone any time of year. I love that little bit of twine that you added too. What a beautiful Fall/Thanksgiving card. Love the colors, design, leaves and sentiment. This is a pretty fall card. Leaf dies that I have. Oh, I just love those bright autumn leaves. 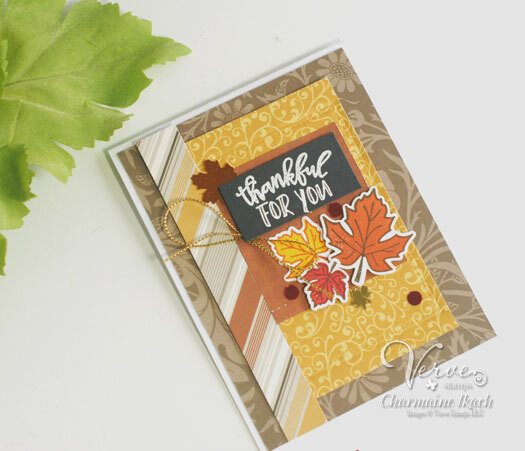 Beautiful card, Charmaine! Sweet backgrounds for your lovely card! I really like your creation - just so pretty!!! That's the perfect fall card ! Pretty combination of prints in beautiful colors! Love the leaves! Such a stunning fall card! 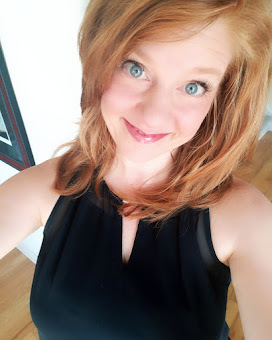 I love the pop of the bright fall colors against the neutral background. You've done a wonderful job on this card. So festive!